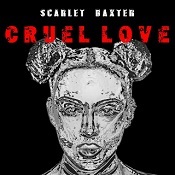 Scarlet Baxter has been steadily plugging away at the business of becoming a bona fide pop star for a couple of years now and “Cruel Love” is her fourth single in pursuit of her goal. The writing credits for the song include the Boombox team (John McLaughlin, Jud Mahoney and Natalie DeLucia) and Dominic Ireland as well as Scarlet herself. The production’s spot-on with disjointed percussion loops, piano chords and synth bass dropping in and out of the mix as Scarlet’s vocals are applied in layers as harmonies and as a repeated rhythm pattern to support the lead vocal, which shifts easily through the gears from breathy to barnstorming. There are so many changes of tempo and texture that even the shortest attention span shouldn’t be troubled too much. With a bit of support, this could be the one that gives her the breakthrough. “Cruel Love” is released on July 20th.